Portfolio systems are a long-standing investment technology solution. Vendors have a solid reputation for adopting and assimilating innovation once the market sets its requirements. Digital advisory modules represent a new and significant step forward on the innovation raceway. At the same time, stand-alone fintech firms or specialized point solution providers that are providing financial institutions with digital advisory software toolkits are fast emerging. They are setting the bar high for digital advisory modules that are sophisticated as well as cost and time efficient. 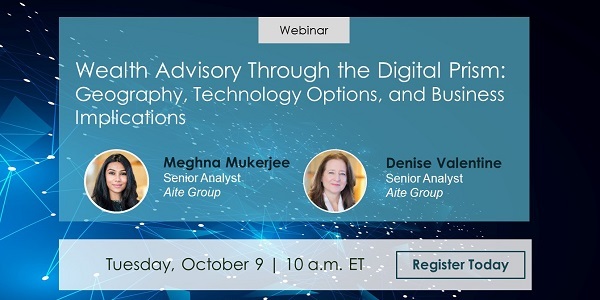 Review the webinar with Aite Group senior analysts Meghna Mukerjee and Denise Valentine as they explored the digital wealth advisory space. How are portfolio systems mainstream technology and what does this mean to the business? Who are the early risers? What is the roadmap? What does the landscape of business-to-business point solution providers look like? What are the advantages of these relatively small players? What differentiates digital advisory modules? Clients of Aite Group's Wealth Management practice can access the full webinar on-demand by logging into our website.